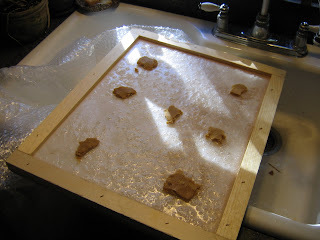 BeeKeeping Candy Boards--I have been doing a lot of research on how to better assure that your bees survive the winter. Food supplies can begin to be in short supply depending on the amount of bees that have survived the winter. I purchased this from a bee supplier on line. It is a flat board with sugar on it that has been boiled down to make a candy consistency. The brown things on it are something called "pollen patties". This should bring a lot of food so the bees will be good and healthy until they get to spring. I have it hanging over the sink because it is very sticky! I brought it up to the hive and put it in, checked it a short time later and the bees were all over it, telling me I was just in time because they probably were down to the last of their food supply.